1980; 394 pages. Author : John Kennedy Toole (1937-1969). Genre : Contemporary Lit. Awards : 1981 Pultizer Prize for Fiction (posthumous). Overall Rating : B. After JKT committed suicide by running a garden hose from his car's exhaust to its interior, his mother hawked his unpublished manuscript to various writers. It caught the eye of author Walker Percy in 1976, who in turn touted it, whereupon it became a cult classic, then gained a widespread readership after winning the 1981 Pulitzer. ACOD is a slice of life of a group of lower-class characters in New Orleans in the early 1960's. 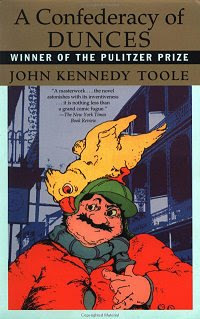 The central figure is Ignatius J. Reilly, an overweight, overbearing, manipulative, egotistical, lazy, lying 30-year-old, still living with his mother and content to be going nowhere in life. There's a host of supporting characters as well, including the dominating, drama-queen mom; a luckless, picked-on detective; a senile octagenarian woman still working at a pants factory; and a talentless wannabe stripper trying to work a cockatoo into her act. PWP? Simon & Schuster had some early interest in the manuscript, but declined it with the note that it "isn't really about anything". Which is kinda true. There are a bunch of loosely-connected threads meandering through the book that make you wonder what Toole intends to do with them. It reminds me of Vonnegut's Breakfast Of Champions, where the "plot" is simply the (first-person) writer manipulating a couple characters to meet up with him at the end. Judging from other reviewers, this is a love/hate book. Those who love it claim it is the laugh-out-loud funniest book they ever read. While there are some slapstick elements to it, I can't say it is anything more than mildly amusing. But to each his own. Those who hate it claim Ignatius is without any redeeming qualities and are just revolted about having to read 400 pages about his (lack of) exploits. I can see their point. I give ACOD a "B" because, despite the multitude of flaws in Ignatius, I couldn't help finding him to be a likeable guy. Ditto for the rest of the people around him. They truly are a Confederacy of Dunces, yet I was unable to work up any antipathy towards them. They may be poor, downtrodden, mean, and petty; but I found myself warming to them anyway. Thank goodness I don't know them in real life. Then too, I was impressed with Toole's ability to tie everything together at the end; and in a way that I wasn't expecting. So if you're looking for a book with rock-em/sock-em action, pass by ACOD. Pick this up when you're in the mood for an existential, character-focused look at ordinary Southern life, and see if you end up liking the unlikeable Ignatius. Like I told you before, I can't remember if I read this book or Babbett by Sinclair in my second year of college. I have no idea why I get those two texts mixed up. Either way, I should read both. I don't think I understood the one I did read, so it's time for reread, and my sister Becky told me last year that this one is hillarious. there are some very funny situations here, such as when Ignatius' hotdog cart tips over in front of an oncoming trolley. the question is whether Ignatius' obnoxiousness overshadows the humor, or the other way around. I just remember Becky talking about the mom starting in on some crazy story, and Ignatious yelling, "I don't need another dialect story" or something to that effect. She thought it was hillarious. yeah, actually Ignatius is very articulate, and his diatribes were quite the vocabulary-builder for me. the relationship between Ignatius and his mom is complex. they royally get on each other's nerves, but with the dad/husband dead, they need each other too. the relationship does get resolved at the end, but it would be a spoiler if i gave the details. I just got this book from the library. I'd known nothing about it, so thanks for the review. I have a friend that ranks it as one of her favorites. I've just downloaded iStripper, so I can watch the sexiest virtual strippers on my taskbar.